This is why I have not done any more sewing this week. A friend recently went to IKEA and picked up 3 Alex cabinets for 3 of her friends. Thanks Sue! My husband put it together and I've been sorting and rearranging ever since. Just look at all those narrow drawers--perfect for thread bins. The bottom two drawers are a little wider and once I pick up a few more containers from the Dollar Store, I hope to move my assorted fiber bits into there. The cabinet fits perfectly under the fold out section of my sewing cabinet. Finally, all my threads will be together and accessible. Yesterday, I had my Shibori Birch Tree Workshop with 5 enthusiastic ladies. It is the first time that I have given this one, so I learned a few things from it. We managed to get most of what I had planned in; however, we could have used a little more time. If I were to do it again, I would divide it into 2 days, perhaps a week apart. I taught how to paint the shibori trees using cans, how to cut out and fuse foreground birch trees, and how to add some painted details to them. We made needle lace leaves and confetti leaves. Then they started their stitching on the piece. Jam packed! They all turned out wonderfully and everyone's had their own unique look. Today, I've been unpacking, and doing most of the things I do on Monday's -- filing, paperwork, etc. Taking a breather after a busy day yesterday. To relax, I like to sit with my knitting. I currently have a couple pairs of socks on the go. These ones are almost done using Hermione's sock pattern from Ravelry. I've also started these ones with an alpaca wool mix-- pattern Faux Cable on Ravelry. I like different projects for different moods. 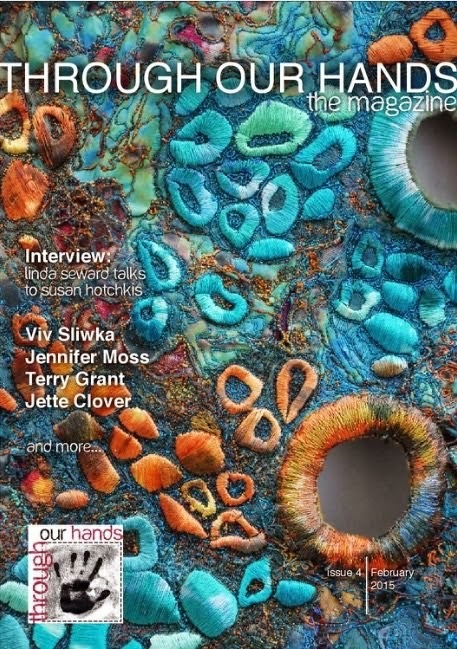 This afternoon, I got the exciting news that one of my fiber art pieces, The Tetagouche River Embankment, has been juried into the SAQA Atlantic region show, Structures. It opens on June 5th at the Art Gallery of St Francis Xavier University in Antigonish, NS. I'm not sure yet if I'll make the opening but it would fun. One of the venues is Charlottetown, PEI. I might get to that one. I'm ready and packed for my workshop tomorrow. My husband helped me drop off my Rubbermaid box of supplies over to the Sobey's room so I'll just have my sewing machine cart tomorrow morning. Since then, I've put in about an hour of thread painting on the Wave. It seems hardly noticeable because I've still been adding the darker colors before I can get to the high lights and white parts of the wave. I did stitch down the surfer (my son) and do some of the detail work there. Is it ever going to stop snowing? This view through my studio window would be beautiful were it mid winter. Enough already. I so wanted to wear my bright new shoes tomorrow. We'll see how much snow is actually on the ground Maybe I'll get away with them. 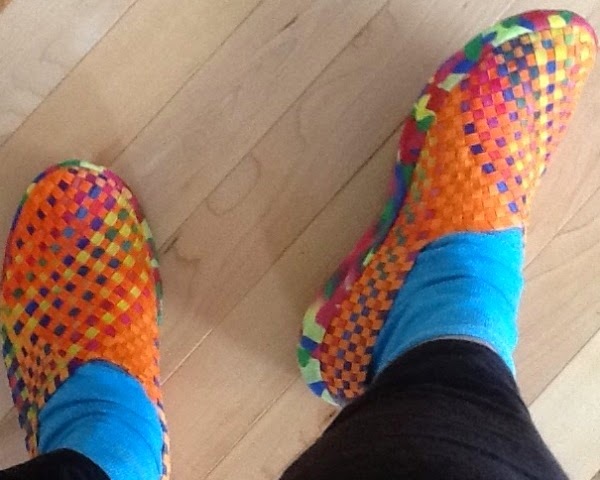 They're actually made of woven 1/4" elastic on top--so comfy. I've been busy organizing, sewing and packing things for my workshop on Monday. I've gotten the class sample as far as I would like it to be in order to show the different stages and to be able to do a little stitching as a demo as well. The background has dark grey spots and branches added with fabric paint. Shading and spots added with paint to the fused foreground trees. Some free motion stitrchwork begun. I'm almost ready. I confidently assured my students that they could do the trees in this method without 'artistic background'. I had a friend who is taking the class over for lunch and a preview to see what she thought. She's excited. Do you think you could do it? Later this afternoon, I squeezed out a bit of time to do a little more thread painting on the Wave. I've only just begun. Also, I made some needle lace by free motion stitching tiny spirals onto stretched netting in a small hoop. I've laid it on to see what it will look like, but there is much stitching to be done first. In the detail, you can see some of the stitching so far. For supper, I've thawed sole filets which I plan to bake in parchment packs along with some veggies. I like doing a bit of creative cooking, but sometimes it's hard to pull away from my art work to get it started. I'm so anxious to get some stitching done on the Wave, but I'm giving a workshop on my birch tree method. in a week and I've got to get the samples and supplies ready. At least, I ironed all the little bits that I added yesterday so I could clean of my ironing board.There are a few small changes that I made even since I took the picture. Now, it's laying next to my machine with some thread colors picked out. Also, I just ordered some colors that I'm missing. Hope they come soon. While it was up on my design wall, I added some cheesecloth in the area where I want the white frothy water to go. I'm not going to use it; I just wanted to see how the white will look. 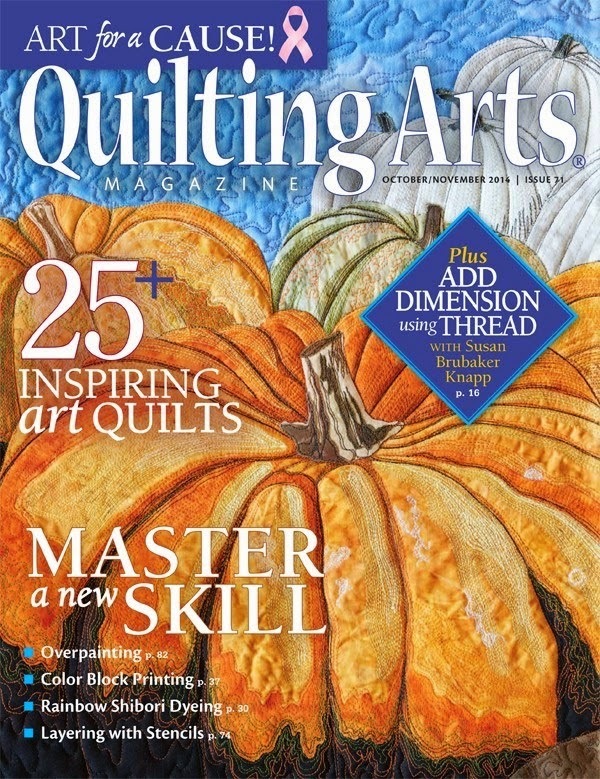 My workshop is on the shibori tree method that I wrote about in Quilting Arts magazine , April/May 2013. Even still, Im in love with this method. After wrapping the can with string and some marbled batik,fabric which is scrunched down as I wrap, I dab on the grey/white fabric paint. Removing the string right away prevents the wrinkles from getting too permanent. After drying, I heat set it and then add some grey shadows, some grey branches here and there, and the black marks which are so indicative of the birch trees. I've done the right side only to show the difference. Here I'm auditioning some fused tone on tone white fabric for some foreground trees. Before I fuse them down, I will add stabilizer to the back and do a little free motion stitching on the background. It's been a pretty productive Monday, as I've got bed sheets on the line, I was snow shoeing (probably the last day before it rains) before noon, and I've thrown together a blueberry rhubarb crisp which is in the oven now. I am tired, but a good tired as the saying goes. You may have noticed my absence from the blog. 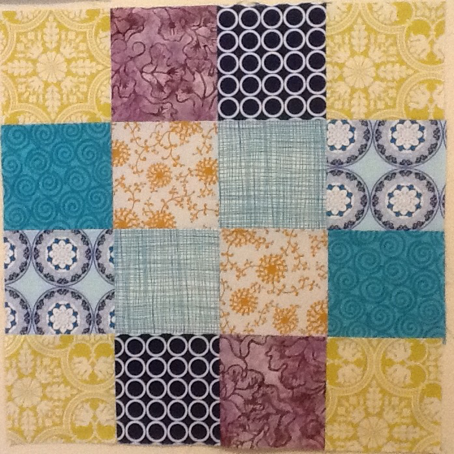 I've been away in Saint John, NB for SAQA (Studio Art Quilt Associates) retreat. It was a jam packed weekend with good food, (yeah, no cooking!) where I met lots of fiber artists form the Atlantic region. Each person's work was unique and awe inspiring. I also stayed at my son's and his fiance's for a couple of nights, having a little visit with my grand puppies. Bosco, the grey Aussie-doodle, just had his first birthday. He's a sweetie, very affectionate. Imagine when he crawls up on my chest for a snuggle! They sure are great company for each other. I came home on Monday night exhausted and I've slowly been recuperating. This morning I made it to my weekly yoga class only because my friend was picking me up. I wasn't my usual self, but I've been taking it easy for the rest of the day. It is beautiful out, but I haven't gone out other than to hang a line of clothes. I've been anxious to get back to work on my latest art piece. Yesterday, I unpacked, washed clothes, cooked and organized my sewing studio. Today, I could get back to work.Although it doesn't look like I did much, I've been fusing, cutting and arranging bits for 2 hours. My back was complaining and I needed to stop for a snack break. I pulled up all the large pieces, laid them back exactly where I want them, and started cutting the little bits of colors for the ripples and dark spots. I'm hoping another day will do it and I'll be ready for the stitching. This is a quick post to show the very little bit more that I added to The Wave today. I'm getting ready for a retreat on the weekend. 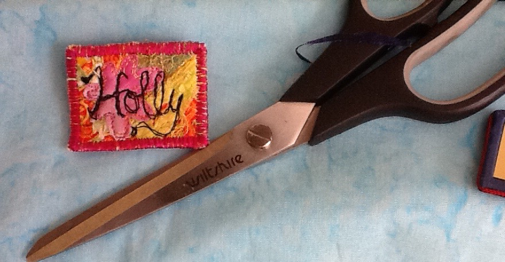 There are a few odd things I need to finish such as this little name tag. I had the brooch already, so I saved time--took the pin back off,stitched my name, and put it back on. I was supposed to be gathering together some fiber Art for show and tell and instead couldn't resist adding some bits. I'm only auditioning the light blue on the bottom for color. I will get to a fabric store while away, and I can look for something. It's still a ways from the sewing machine and I'm so anxious! Well, my daughter, Caley did manage to finish her cushion covers for her apartment before she left yesterday afternoon. I put them on my cushions for the picture. I quite like her choice of fabrics from my stash. Even though she hasn't sewn in about 8 years or so, and then just the basics, she did the whole thing with my guidance. She quilted in the ditch vertically and horizontally. The back has a Velcro closing. After a snowshoe trek on the fresh snow with my friend this morning, I had a short rest (with a shut eye), and then I went into my studio to do a little more on The Wave. This is based on a photo that my son recently sent me of himself winter surfing. 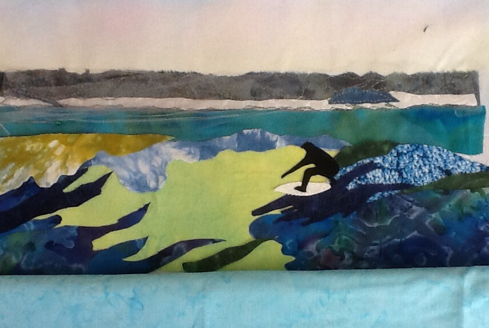 I'm working at my ironing board, using a tracing paper overlay, drawing and cutting fusible backed fabrics as I go. I've got the tracing paper taped to the top of the interfacing backing, so I can flip it down to draw the pieces and then lay them into place with tweezers. I keep referring to the picture on my I Pad for color reference, going back to my tracing paper pattern to cut shapes. I have already stitched the background trees with the snow and netting on top. The netting greys the fabric a bit as I didn't have quite the right color. The turquoise color will also be greyed with either netting or stitching. Yes, no surfboard yet. I'm still working on getting all the basic shapes laid down. This is a small piece, maybe about 9 by 11". I hope you're creatively enjoying your day. Yesterday, my daughter arrived from Charlottetown for a two day visit. She is doing her final practice teaching for her BEd degree, graduating May 9th. We went for a walk and watched a movie last night. This morning, we emptied all her boxes that are stored downstairs and edited about six boxes down to one large Rubbermaid box. Yippee! We were home this afternoon snacking on the hot cross buns I had just finished when she says she'd like to make pillow covers like my sofa cushions for her apartment. Off she goes to my sewing room to look through my stash. This is around 3:30 and she says she'll finish them before she leaves after lunch tomorrow. I should also mentioned that she hasn't touched a sewing machine in about 7 years. Lots of confidence there. And oh, she wants to quilt them in that crazy way I do ( stippling)! I'll have to teach her. She cut 32 squares and put them together. After a call to the boyfriend for measurements of her sofa cushions, I think a small border is needed. I took this with my I Pad in low light, so the colors are way off. There is actually a bit of mauve in the circle print. I'll get a better finished picture. We are in the midst of another crazy snowstorm, so at least we've got something to do. 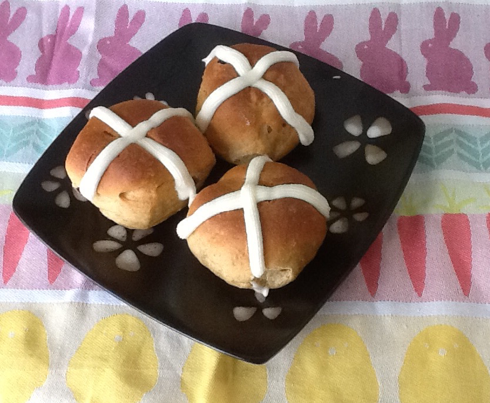 I tried a new hot cross bun recipe-- not my family one-- just for fun. I'm going to be lazy and just tell you to Google Crosbys molasses hot cross buns and you'll find it. For those who celebrate, happy Ester!